Recently, LATINO Magazine brought together a group of prominent figures in government, business and public health to discuss the special connection between the Latino community and the benefits associated with green space in our communities. Participating were Los Angeles Mayor Antonio Villaraigosa; U.S. Hispanic Chamber of Commerce (USHCC) President Javier Palomarez; Dr. Gilberto Cárdenas of the Inter-University Program for Latino Research; and noted public health expert Dr. David Hayes-Bautista. LATINO: Mr. Palomarez, the USHCC recently released a major study which confirmed the important role that the landscape and lawn care services industry plays in providing entrepreneurial opportunity, jobs and income to U.S. Latinos. What did you learn from the study? Javier Palomarez: Our study, which was conducted by Inter-University Program for Latino Research, confirmed that the landscape and lawn care industry is a significant creator of entrepreneurial opportunity and income for our community. It is very much the kind of “low entry cost/high sweat equity” industry that provides immigrants and their American-born children with a starting point and pathway into the mainstream economy. 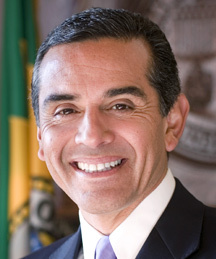 LATINO: Mayor Villaraigosa, you’ve been seen as a leader among the nation’s mayors in promoting green space in your city. What are some of the ways you have approached this effort? Mayor Antonio Villaraigosa: The creation of additional green space in Los Angeles is a central part of my vision for a healthier city. Over the past six years, the city has added 650 acres of green space to our urban landscape. That’s more acres than the previous 12 years combined---and we’re not done. Over the next two years, we’re hoping to add 50 pocket parks in the neighborhoods that need them the most. Many of these new park spaces have been added along the Los Angeles River. Once considered a lost cause, the River Revitalization plan has put the river literally back on the map after the EPA deemed it navigable in 2010. We are also focused on increasing the number of trees in our city since we know that trees are critical to the quality of life in LA. That’s why we began The Million Trees Initiative to improve air quality, reduce temperature, increase energy savings, and ensure the City has a sustainable and healthy urban forest. LATINO: Dr. Hayes-Bautista, from a public health standpoint, what are the issues for the Latino community related to creating, maintaining and expanding green space? Dr. David Hayes-Bautista: There are two important, inter-connected issues here that bear mention. First, there is a growing obesity epidemic in the Latino community. Studies show that adolescent Latino boys are far more likely to be obese than their non-Hispanic white counterparts. The dangers of childhood obesity are significant, including its contribution to diabetes, asthma, hypertension and adult obesity. Second, there’s what I call a “green space divide” between many urban, and often Latino-majority, communities and more affluent suburban, and often non-Hispanic white majority, communities. Generally, Latino communities have far less healthy, properly-maintained green space available for use. The only viable intervention is to increase properly-maintained green space, especially in lower income, urban communities, to promote physical activity as we simultaneously work to address issues of nutrition and diet. All other approaches are simply too costly, will take too long, or will harm local economies and businesses. LATINO: The landscape and lawn care industry has its critics. Some claim that green space which is maintained with herbicides and fertilizers can be harmful, especially to children. How do you evaluate such claims? Dr. David Hayes-Bautista: I’ve looked at cancer and exposure issues from a couple of different perspectives. Several years ago, I have examined farm worker exposure to pesticides in California. Obviously, this is a far more intense exposure than someone playing in a park or on a school soccer field would have and so, to my mind, represents a “worst case” scenario. We found the exposure risk to be low as the data showed that agricultural area Latinos had lower risk of cancer than urban Latinos. More recently, I participated on a panel discussion on these issues. One of the other panelists is a consultant who has worked on these issues and who separately serves at the Harvard Center for Risk Analysis. She summarized research that she recently completed which examined the risks of several commonly-used lawn and landscape products. I agreed with her point that these products do not present any significant risks provided the application instructions are followed. In my view, any risk associated with these products is far outweighed by the public health benefits associated with the availability of properly maintained green space. LATINO: Dr. Cárdenas, your study confirms that Latinos play a disproportionate role in an industry that is also central to addressing the obesity epidemic disproportionately confronting the Latino community. How many jobs did your study find are held by Latinos in the green industry? Dr. Gilberto Cárdenas: The landscape and lawn care industry employs almost 1.6 million workers and generates almost 959,000 jobs in other industries. In total, Latinos account for more than 830,000 of the workers in both categories combined. Since Census figures do not capture family and sole-proprietor businesses in the industry, we think it is more than likely that a similar proportion of the businesses not counted in Census data are also Latino-owned, making the overall actual numbers even larger. The data also shows the industry provides a strong source of entrepreneurial opportunity to Latinos as the proportion of businesses owned by Latinos is almost double the national average for all industries. LATINO: Mr. Palomarez, what are some of the “bigger picture” issues you think should be kept in mind when discussing green space and the landscape and lawn care industry? Javier Palomarez: It’s important to remember that many of these businesses are local, family-owned companies. These companies don’t want to simply make the sale, they want to be a part of improving the neighborhoods and schools in the communities where they operate. They are natural partners for local and state officials looking to bring Latino entrepreneurial and worker skill to bear in making a difference in our communities and schools. I’m also confident that they have the knowledge to properly apply the right products in the right way so that all the benefits are realized from healthy green space. I believe lawmakers should be particularly attentive to this industry’s needs as it is an economic and opportunity engine for our community that can also help address pressing social needs in our community. This is especially important to recognize since these are the kinds of jobs cannot be outsourced overseas. They provide a solid economic base that will be here tomorrow and well into the future. LATINO: In closing, Mayor Villaraigosa, what would you recommend to policymakers at all levels of government in terms of a green space strategy to meet public health, education and economic goals? Mayor Antonio Villaraigosa: Think big. Green space not only makes our neighborhoods more livable, it helps address the global problem of climate change. Since 2007, we have been addressing this issue through the “Green LA Climate Action Plan” which offers a comprehensive and aggressive 50 step plan to take the challenges of pollution and climate change head on, including through the expansion of green space. In Los Angeles, this has included our efforts to plant more than 300,000 trees and create 650 acres of new green space. By making investments like these, we are saving our city money, planning for the future, and making Los Angeles a healthier, more sustainable city for generations to come.